Sponsorship guarantees are getting more and more common, as a way to secure new business. But what happens when the expectations sold (sometimes, those offered in better economic times) don't match the result. That's what Bartley Kives of the Winnipeg Free Press asks today. Back in 2007, city council approved a plan to sell the naming rights to city buildings, vehicles or even services as part of what Mayor Sam Katz described as an effort to "fix our crumbling roads, provide city services and keep our taxes competitive." The city later issued a tender to find a company to sell those rights and selected Winnipeg's Chess Communications in January of this year. City council then approved a $785.3-million operating budget that called for $1.5 million to flow from corporate or individual sponsors. None of the cash has materialized so far, chief financial officer Mike Ruta notes in a financial status report that goes before council's finance committee on Thursday. City Councilman Justin Swandel says the agency over estimated, but he is still optimistic that the sponsorship money will flow albeit probably not at the $1.5MM/year level. 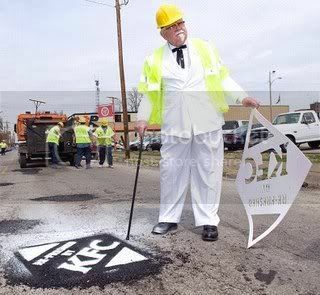 The promise of municipal sponsorships as a way of financially supporting city services took on added notoriety earlier this year when KFC proposed the idea of letting the colonel fill city potholes in five major cities. In Winnipeg though, another story. These are the dangers of relying on unsecured sponsorships to fill critical city services.